Revenue has deferred the planned application of VAT to food supplements until 1 November. In a statement, it said the decision was in light of the Minister for Finance setting out plans to examine the policy and legislative options for their taxation. Industry bodies and consumers had expressed concern in recent weeks about the plans to stop allowing certain food supplement products to be zero-rated for the purposes of VAT on 1 March. This would have resulted in 23% being added to the cost of many popular and widely used vitamin and mineral supplements. Revenue said it had originally carried out a review of the situation as a result of growing concerns among industry representative bodies about the difficulties in distinguishing between food supplement products which qualified for the VAT exemption and those that did not. The organisation subsequently issued new guidance last December which was to take effect on 1 March. According to Revenue, the Minister for Finance wrote to its chairman, Niall Cody yesterday, stating that during the committee stage of the Finance Bill last year he committed to address the matter through a specific paper to the tax strategy group during the summer. "To ensure that this policy review will be effective, I propose to issue a public consultation seeking engagement from all parties on the issue and to consult with my colleague, the Minister for Health, to ascertain his views on the use of food supplements," Mr Donohoe said in his letter. In a statement this evening, Revenue said that in support of the Minister's proposed review and to allow time for the enactment of any new laws, it will delay implementation of its new guidance until 1 November this year. 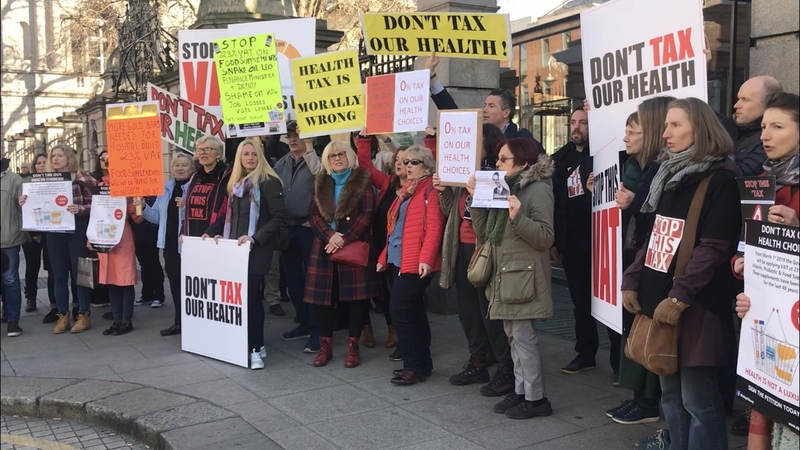 Earlier today protesters gathered outside Leinster House to voice their anger over the planned VAT increase. Health Food Shop owner Mai Cass from Portlaoise appealed to the Government to reverse its plans. "We're here today to ask the Government not to tax our health, a burger is taxed at 13.5% and they want to put 23% on all food supplements. "We don't feel it's right we are trying to encourage people to be healthy and you would think the Government would be on board but they're not." Áine O'Beirne from the midlands also attended the protest. She said: "I depend on supplements because I have a mental health diagnosis and a couple of health conditions and depend on fish oils B vitamins, magnesium and vital supplements for my health. "I don't take drugs at the moment, I'm taking personal responsibility for my health and I'm saving the State money by not being in hospital and taking responsibility for my health." Mr Howlin said the increase would make the supplements unaffordable for many people who need them. He is also calling on the Government to reverse the planned increases and to put the proposals to the Dáil. He said: "I have asked Paschal Donohoe to reverse this and at least seek the proper authorisation of Dáil Éireann for any tax measure. "The notion that the Revenue make policy is something that is not acceptable – the Dáil makes tax law, the revenue interpret it and if the government change a situation that has existed in this country since 1972, which is the VAT-free status of health food supplements, then they should put a proposal to Dáil Éireann."